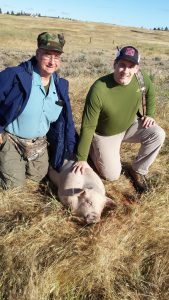 Pictures from our recent pig hunt at Clover Creek Ranch this past Wednesday. Don put us on the two pigs in minutes! Matt and Briggs(sp?) were also helpful in dressing the hogs for the trip back. The hogs are at the butchers getting processed right now. Stephen and I were told that the deer hunting is quite good in recent years. We might be back in 2017 for deer. Thanks for the great time and great service from the staff! Thanks so much! This entry was posted on Thursday, July 14th, 2016 at 5:30 pm	and is filed under Uncategorized. You can follow any responses to this entry through the RSS 2.0 feed. Both comments and pings are currently closed.